Since the early 1980s, Pendarvis Manufacturing has been offering extensive capabilities in precision CNC machining, machining, welding and custom fabrication services to the Los Angeles area. One area of precision CNC machining that we have available to all of our Los Angeles area customers is high speed machining, utilizing our CNC vertical mills and support equipment. 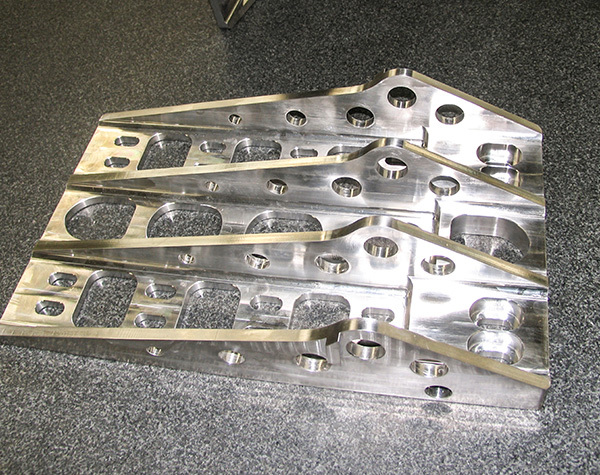 High speed machining is a continuously evolving technique of machining. High speed machining calls for a blend of various machining methods, which results in the fast manufacture of high quality machined parts. The key components to successful high speed precision machining are the CNC machine, the cutting tool, a high quality CAM program/system, and the material being machined. As high speed machining has evolved, the available cutting tool technology has advanced. Specialized cutting tools for high speed machining have a completely different set of cutting characteristics when compared to traditional cutting tools. Other factors include efficient area clearance, keeping the load on the CNC cutting tool as consistent as possible while minimizing any sudden changes in the cutting direction. Pendarvis Manufacturing utilizes the latest version of Surfcam Velocity, from Surfware, for its high speed precision machining. The manufacturing staff at Pendarvis Manufacturing has over 210 combined years of experience in all facets of precision CNC machining, including high speed machining. We are leaders in CNC machining in Los Angeles and have the necessary in-house equipment at our Los Angeles CNC Machining jobshop and team members skilled in high speed machining technology, allow us here at Pendarvis Manufacturing to quote on your high speed machining requirements!